PTFE hose which was initially used in hydraulic or pneumatic systems or in the aerospace sector is rapidly becoming popular. Hoses and tubes made out of PTFE perform brilliantly, under challenging environmental and industrial conditions, and hence its commercial usage across industries is on the rise. Due to its high commercial usability and its exceptional properties, PTFE products are an important commodity of the industrial, medical and consumer markets, where they are used not only in the traditional way but also in non-traditional and unconventional ones. PTFE Hose is a tube consisting of an inner PTFE liner and an outer protective cover. The PTFE liner is similar to a PTFE tube having an outer protective cover which increases its pressure withstanding capacity. The combination of outer cover and inner PTFE liner makes a hose an important instrument in many applications. The following features need to be considered for PTFE tubing, when selecting them for a particular application. Convoluted or smooth bore: The main distinguishing factor in case of a PTFE hose is the bend radius and the size. The bore size for a smooth bore will be either less than, or equal to one inch. Also, the bend radius of a smooth hose will be a minimum of 12 inches while that of a convoluted bore will be a minimum of 3 inches. Thickness of the PTFE hose wall: PTFE braided hose are manufactured with different thicknesses of their walls. In applications where severe flexing of the hose takes place, thicker walls are preferred as they provide a better resistance to buckling. The thick walls of a hose also provide a lower permeability for gases, but they occupy more space. 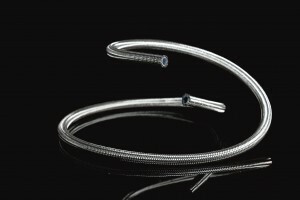 Braid Material: Type 304 stainless steel braid is usually the material of choice in most cases. However, in case of marine applications, type 316 stainless steel braid is used. Besides, the braid used should be made up of stainless steel if the hose is to be used in an extremely corrosive environment. And, the braid should be made up of bronze, in case the hose is going to be used in a high frictional environment, due to its good lubricating property. 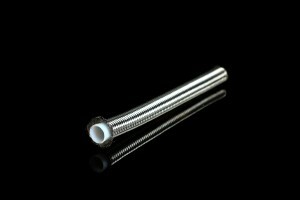 By selecting proper PTFE hose, industries can leverage upon the exceptional qualities of PTFE and derive numerous benefits out of it. Selection of the right material will result in a better performance, and will eventually mean a lower cost of ownership, wherever the product is used.